"Many Hands Make Light Work" is the motto of our Charity Committee. Your Charity Committee Chair for 2018 is Betty Huffman. Stop by the Charity Table to pick up some fabric, a pattern, and/or a kit. The Committee makes quarterly deliveries to Franklin and Bedford Counties. All the efforts of individual guild members make the deliveries possible. We donate bears, pillow pals, quilts, pillowcases, and Christmas stockings. For the 2018 year end report of donation items delivered to Bedford and Franklin Counties click here. For a list of the donation locations and the items they have requested click here. 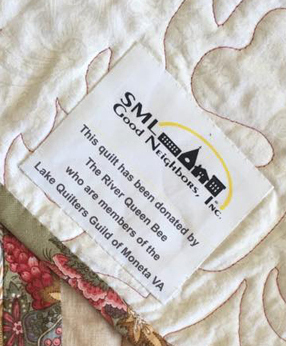 On March 3, 2017, the SML Good Neighbors raffled a quilt to help raise money to replace their headquarters, which burned to the ground last fall. The raffle quilt was sewn and donated by LQG River Queen Bee. 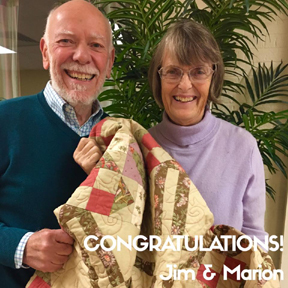 The winners of the quilt were Jim Bennett and Marion Wagner. In 2015 LQG Bees made quilts for The Good Neighbors for their summer interns. Sadly when their headquarters burned to the ground on 11/10/16 the quilts were also lost in the fire. So once again our bees are busy making quilts for future interns that will be housed in the new Good Neighbors "home." 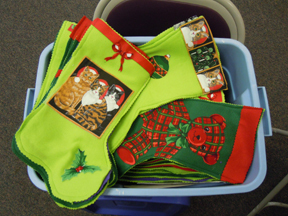 These stockings will be given to the Franklin County STEP program to be distributed to the children at Christmas time. "Many Hands Make Light Work" is the motto of our Charity Committee. New members are always welcome. Your Charity Committee Chair for 2016 is Betty Huffman. For the 2016 year end totals of donation items delivered to Bedford and Franklin Counties click here. The River Queen Bee of Lake Quilters Guild has decorated a tree in the Festival of Trees at the Bedford County Welcome Center. The theme this year is a Down Home Country Christmas. The River Queen Bee is trying to raise money for Lake Christian Ministries by having people vote for tree No. 21. The voting is from November 16 until December 31, 2016 at noon. The center is open from 9am-5pm. It costs $1 to vote. So come vote and enjoy the display of the community of trees. (Decorated tree pictured below). Information and photo submitted by Nancy Robbins, 11/17/2016. 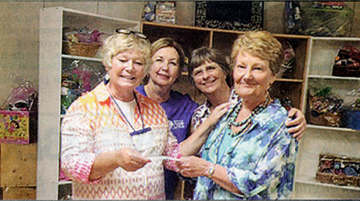 In August of 2016, the SML Lake Quilters Guild donated $500 to the the Agape Center. Pictured front left is Karen Jones of the Agape Center and on the right is Stephanie Schaefer, President of Lake Quilters. In the back row on the left is Janet Sellers and on her right is Eileen Hawkins, both are Agape personnel. LQG Bees Make Quilts for SML Good Neighbors, Inc. This "Umbrella" quilt was made by the Shady Ladies Bee and donated to SML Good Neighbors, Inc.
Photo submitted by Janis Hagen. Note to all Bees: The Good Neighbors is in need of 9 quilts for the home that they bought for the summer interns.The quilts will stay with the house. The beds are EXTRA LONG TWIN. Dimensions for extra long twin is 63 x 92 or 71 x 112 if you want a larger overhang. The mattress top is 39 x 80. If able to make one please let Sharon Cullen know. Thanks to the membership Good Neighbors now has enough quilts for the beds. At our May 2015 General Meeting President Susan Palmer presented a quilt to Denise Tuttle, Executive Chair of SML Charity Home Tour. The "Home Tour" wall hanging was made by members of the Kept in Stitches and Sunshine Bees. The quilt honors the 25th Anniversary of both the Home Tour and Lake Quilters Guild. Tuttle plans to display the wall hanging during volunteer training for the Home Tour. View close up photo of quilt. "Many Hands Make Light Work" is the motto of our Charity Committee. New members are always welcome. Your Charity Committee Co-Chairs for 2014 are Marnie Brush and Sandra Ferguson. For a report of donation items delivered to these locations click here. For the 2015 year end totals of donation items delivered to Bedford and Franklin Counties click here. 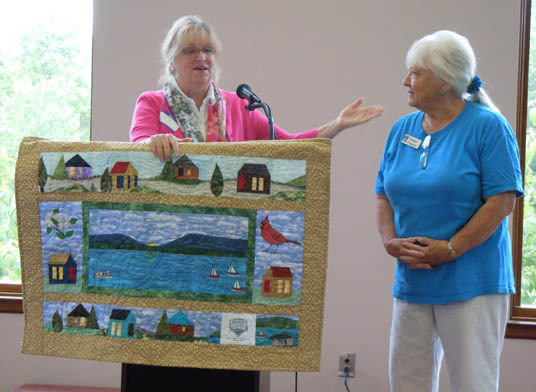 Cindy Clark Donates Lake Quilt to the Chamber of Commerce. Photo courtesy of Barb Nocera. Pictured above are Cindy Clark and Susan Palmer of Lake Quilters Guild. Displayed behind them is the SML 50th Anniversary Quilt which was designed, pieced and quilted by Cindy Clark. Cindy and Susan presented the quilt to the Chamber of Commerce on Friday, October 24, 2014. 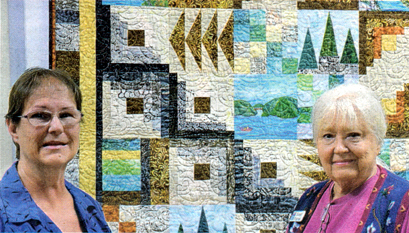 The quilt depicts Smith Mountain Dam, as well as other local water and mountain scenes. Smith Mountain Lake will officially celebrate its 50th Anniversary on March 7, 2016. Cindy also taught this quilt for our 2015 Block of the Month project. On October 28, 2015, the Laker Weekly ran an article about the quilt Cindy donated to the Chamber of Commerce. If you missed the article in the Laker Weekly you can still read it online. Click here to view the article online... Or here is a pdf of the article. 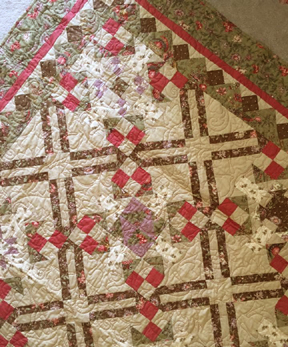 Lake Quilters Guild Quilt Exhibit at Moneta/SML Library, October 1-31. Lake Quilters Guild members exhibited their fabric art at the Moneta/SML Library October 1 through October 31. The show included wall hangings and quilts in traditional and contemporary designs in a rainbow of colors. Holding some of the quilts for the October show, pictured left to right are Lake Quilters Guild members Sue Palmer, Lynn Bowers, Carol Hendrix, Marilyn Doble, Dottie Wilson, and Judy Bukauskas. Photo and caption courtesy of Rosey Clark, Mgr., Moneta/SML Library. To see more library exhibit photos...click here. As of August our charity needs are lap quilts, pillowcases and Pillow Pals. Kate's Easy Peezy Pillow Case Instructions and photos (PDF) Also check-out http://www.allpeoplequilt.com/millionpillowcases for additional pillowcase instructions. Click on "Free Patterns" at top. Sandra's Kitty Pal Instructions and Pattern. This is a variation of the Pillow Pal. Sandra's Revised (2011) Pillow Pal Instructions with Pattern. Quilt As You Go Lap Quilt Pattern. The Charity Committee would like to thank each member who has taken the time to make and donate the various bears, pillow pals, pillow cases, pillows, wheelchair bags, quilts, nursing home bibs, Christmas stockings and knitted items last year. We hope you will continue to be as generous with your donations in 2014 so we can continue to support our many charities in both counties. 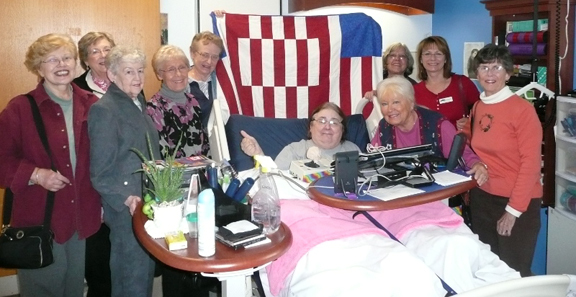 October: Members of Kept in Stitches Bee Present Quilts of Valor to Veterans at the VA Hospital in Salem. Pictured Above: Bette Stubbs, Linda Burke, Peg Jeans, Ellen Hackett, Sandra Feruson, Susan Palmer, Helen Buchanan, Lynn Bowers, and Marilyn Doble. Below: Bee members present another valor quilt. "Many Hands Make Light Work" is the motto of our Charity Committee. New members are always welcome. Your Charity Committee Co-Chairs this year are Marnie Brush and Sandra Ferguson. This year the Committee will make quarterly deliveries to Franklin and Bedford Counties. All the efforts of individual guild members make the deliveries possible. We donate bears, pillow pals, quilts, pillowcases, and Christmas stockings. For a list of the donation locations and the items they have requested click here. For a report of donation items delivered to these locations click here. Download Sandra's Kitty Pal Instructions and Pattern. This is a variation of the Pillow Pal. Download Sandra's Revised (2011) Pillow Pal Instructions with Pattern. Download Sandra's Quilt As You Go Lap Quilt Pattern. "Many Hands Make Light Work" is the motto of your Charity Committee. New members are always welcome. The Committee makes deliveries to Franklin and Bedford Counties a minimum of twice a year. All the efforts of individual guild members make the deliveries possible. We donate bears, pillow pals, quilts, pillowcases, and Christmas stockings. For a list of the donation locations and the items they have requested click here. For a report of donation items delivered to these locations click here. Report includes year end recap from Marnie Brush. On behalf of the Franklin County Family Resource Center, I would like to send all the quilters a warm thank you for your continued support of the families we serve whom are victims of domestic violence. The pillow pals, quilts, pillow cases, head band, hats, afghan and baby quilts which you donated today were wonderful! We will continue to provide them to the families, women and children whom come to stay in our domestic violence emergency stay shelter as a way of comforting and calming their fears in a new surroundings. Our Guild sponsored a Pillow Pal Beauty Pageant which was presented and judged at our February 2012 Charity Sew-in. The entries and winners can be seen in the February Show & Tell Slideshow. Donation Quilt Pattern: Want to make a donation quilt? Try the Magic Diagonal Quilt Pattern from Marlyn. Hospice has expressed a need for "travel" size pillows and pillowcases. The travel pillow is 12" x 16." Janie has created an instruction sheet for making this size pillowcase... Janie's Travel Size Pillowcase Instructions. Also check-out http://www.allpeoplequilt.com/millionpillowcases for additional pillowcase instructions. The 1 Million Pillowcase Challenge will continue in 2011 so anyone wishing to donate pillowcases can continue to make them and donate them to the Guild and Marlyn will report the count online to American Patchwork & Quilting. Learn more at http://www.allpeoplequilt.com/millionpillowcases. The Committee makes deliveries to Franklin and Bedford Counties a minimum of twice a year. All the efforts of individual guild members make the deliveries possible. 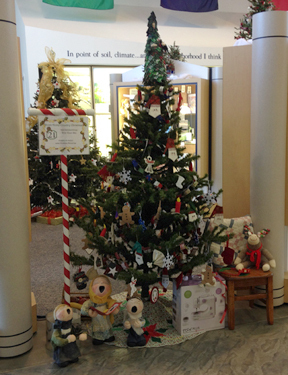 We donate bears, pillow pals, quilts, pillowcases, and Christmas stockings. For a list of the donation locations and the items they have requested click here. Franklin County: 82 Bears, 20 small quilts, 10 bed quilts, 6 wheelchair bags, 90 pillow cases, 29 pillow pals, 12 tote bags, 108 Christmas stockings. 1 knit sweater, 27 pairs of mittens. 2011 Monthly Charity Committee Donation Reports. The Drunkard's Path Block (at left) will hang on the outside wall for all to see at the Artisan Center in Rocky Mount, VA. The large scale wooden block, made by Barn Art, will be the first block on The Crooked Quilt Trail. The trail will follow The Crooked Road, Virginia's Heritage Music Trail and White Lightning Trail; and will be part of The Artisan Trails of Southwest Virginia. The Drunkard's Path pattern was chosen for Franklin County as a remembrance of its history as The Moonshine Capital of the World. The Drunkard's Path Block was installed on the outside wall of the Artisan Center in Rocky Mount, VA, at 8am on Wednesday, August 17, 2011. At right are guild members who attended the installation. We thank Eloise Vass (top left and right center) for all her efforts in making this concept become a reality for SML Quilt Guild and Franklin County. During our February Quilt-in, Cindy Treadway from the Franklin County Resource Center spoke to us about her program and the needs of the center. She took 10 Pillow Pals, 8 bears, 3 quilts and 30 Pillowcases. She also took several pictures of our guild members sewing charity items and put them on the shelter website. Check out the Resource center website: franklincountyva.org/shelter ...go to "Pillow Pals project." If you go to "Project Cover Me" you will see beds with bears on them! Susan Palmer has made a "Purple Heart Quilt" to honor woman recipients of the Purple Heart Award. This quilt will represent the state of Virginia on the Purple Heart Quilt Trail. To learn more about the quilt and view a larger photo click here. January 3 - February 28. The Moneta Library invited Lake Quilters Guild members to display quilted items at the library during the months of January & February. This display was coordinated by Vicky Seekford. (left to right) Alice Vreeland, Betty Hatfield, Mimi McDermet, and Marcia Wright make deliveries to Franklin County locations. Marnie Brush from Smith Mountain Lake Quilting offered an extra incentive for those who stitched up the most charity pillowcases by December 13, 2010- gift certificates for fabrics at her store. 101 pillowcases were donated. Most Pillowcases from a quilting bee or group: The Walnutter's Quilt Group (Kate Holdgreve's group). With a total of 24 pillowcases they won a $30 gift certificate for fabrics at SML Quilting. Most Pillowcases made by an individual: Suzanne Given with a total of 25 pillowcases won a $20 gift certificate for fabrics at SML Quilting. The 1 Million Pillowcase Challenge will continue in 2011 so anyone wishing to donate pillowcases can continue to make them and donate them to the Guild and we will report the count online to American Patchwork & Quilting. 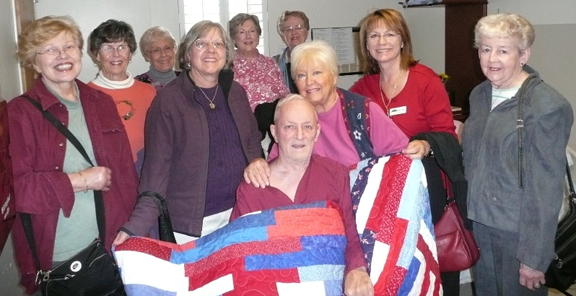 On Veterans Day the Hardy Bee honored Korean War Veteran Bob VandeLinde by presenting him the with quilt shown above. 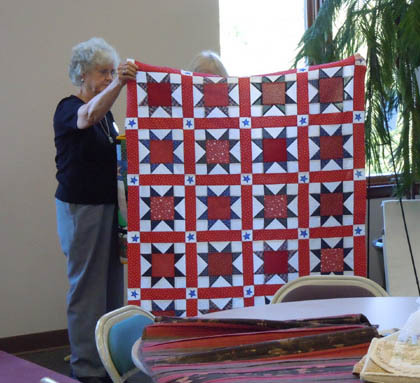 Each bee member made one star block for the red, white and blue quilt. Lake Quilter's Guild donated $300 to Lake Christian Ministries in November. Instructions for Charity Items. Click on the links below to view printable instructions (PDF file) Use your browser's back button to return to this page. Soldier's Cool Scarf - These instructions are on the Soldiers' Angels website. Please notice that they are very particular about colors. If you plan to make these, please hold on to them until the February meeting, at which time they will be gathered and shipped. This will be a "one time only"shipment. Lake Quilters Guild donated $500 to the new Westlake Library to be used to purchase books and magazines on quilting to help further a knowledge of and interest in quilting in our local community. 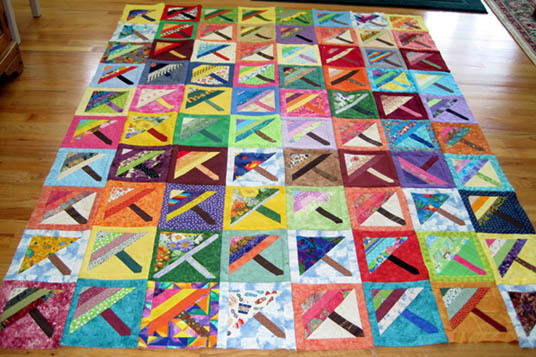 The February 2008 Meeting was our Charity Quilt-in. We need to replenish our supply of bears, quilts, pillow pals, and wheelchair tote bags after our many 2007 charity donations. To see us at work view the February 2008 Slide Show on the Show and Tell page. As a service to our community, the Featured Bee of the Month will display at the Franklin County Library for the month following the general meeting. Raffle Quilts donated to aid worthy causes: Two of our bees made quilts for raffle to benefit the Alzheimer's Association and the charities sponsored by this year's Home Tour. 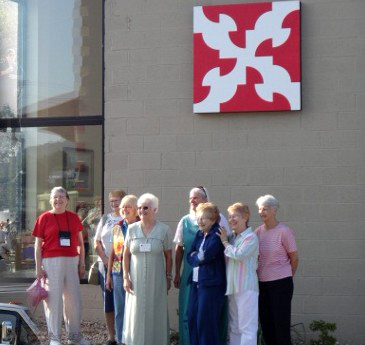 View the quilts and the ladies that made them. Nov. 2007 - Charity Committee Report: includes latest charity item distributions and request for future charity items. May 2007 - Letter from the Charity Committee: includes latest charity item distributions and information on obtaining Christmas stocking patterns and sewing labels for your charity projects. March 2007 - Thank You Letter from the Charity Committee includes totals from Quilt-in and instructions for getting started on the Christmas stockings for Step, Inc. (Head Start of Franklin County). The February 2007 Meeting was our Charity Quilt-In. 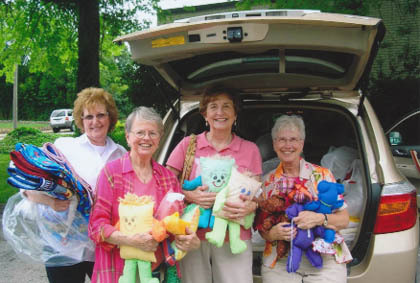 We needed to replenish our supply of bears and quilts after our many 2006 charity donations. To see us at work view the February 2007 Slide Show on the Show and Tell page. on the lower left shelf in white and teal plastic boxes. 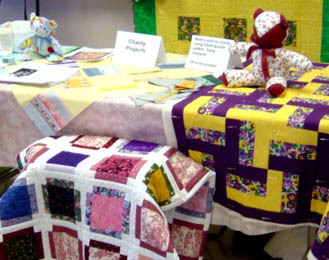 Charity Table at the January 2006 meeting displays examples of the bears and quilts that can be made for charity. 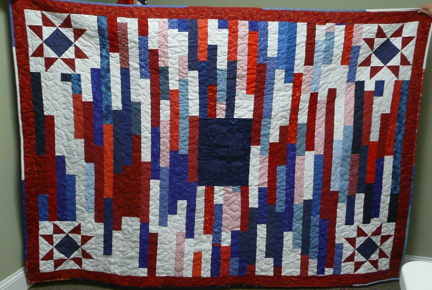 Members may also make and donate a quilt design of their own choosing. The bears and quilts and Christmas stockings we donate are greatly appreciated. Click here to learn how many and where the items have been placed and read the letters of appreciation we have received for our donations. Two of our bees made quilts for raffle to help Franklin Co. CASA and the SML Discovery Shop. View the quilts.